Duramax Marine Introduces DuraBlue. 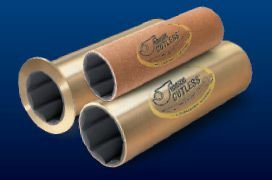 A greaseless composite rudder bushing engineered for high performance. Duramax Marine DuraBlue is a greaseless, pollution-free, self-lubricating rudder bushing designed to outperform traditional bushing materials. DuraBlue proprietary fiber matrix is exceptionally wear resistant, with extremely long wear life, and high load capacity. 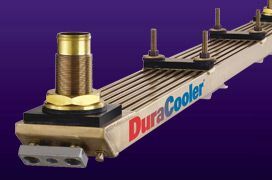 DuraBlue ultra-low coefficient of friction of 0.1 to 0.2 eliminates stick slip. DuraBlue is used for rudder stocks, pintles and steering gear bushings. It is an alternative to bronze, brass, nylon and other urethane based materials. DuraBlue is dimensionally stable. It has a very low thermal coefficient of expansion in high and low temperature environments. Unlike polyurethane rudder bushings that have a wide range of thermal expansion and contraction rate. DuraBlue experiences virtually no swelling in water, and remains stable in chemical solutions. DuraBlue is tolerant to load edging and misalignments. Its fiber composite material is light weight and resists damage and fracture. It maintains a high compression strength, and a high strength to weight ratio. Duramax DuraBlue Composite Rudder Bushings are available in outside diameters: 1 to 42 inches (2.5 – 107cm). They are easy to machine and install. Duramax Marine the world leader in water-lubricated bearing technology, along with engineered heat exchangers, shaft sealing, and impact protection systems. Rubber stamping alternative stern bearing design. 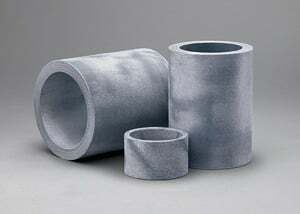 There are a many different types of water-lubricated bearings on the market at the moment, mostly based on various woven composites or elastomer-based materials, but Ohio-based Duramax Marine is convinced that nitrile rubber is the best all-round material for this kind of application. "We have over 80 years of experience in producing rubber products and since 1960 we have been producing rubber water-lubricated stern bearings," said Michael Schonauer, vice president for marketing at Duramax Marine. When oil-lubricated and cooled white-metal stern tube bearings became popular, they were definitely a great technological advance. No more water leaking into the engine room aft seal, changing packing or pumping bilges. But with the ever-present threat of seal failure and pollution risk, water-lubricated bearings are regaining popularity. There are a many different types of water-lubricated bearings on the market at the moment, mostly based on various woven composites or elastomer-based materials, but Ohio-based Duramax Marine is convinced that nitrile rubber is the best all-round material for this kind of application. "We have over 80 years of experience in producing rubber products and since 1960 we have been producing rubber water-lubricated stern bearings," said Michael Schonauer, vice president for marketing at Duramax Marine. Talking to Marine Propulsion he explained the history behind using rubber as a bearing material. It was first developed by mining engineer Charles Sherwood on water pumps back in the I920s. He quickly realized that the rubber handled the very high abrasive mine water very well and that the rubber bearing material basically deflected and allowed the abrasives to pass through without damaging the pump shaft or the rubber itself. it was a ground breaking discovery that technology was bought and licensed by the BF Goodrich Company in the 1922, selling the bearings under the 'Cutless' name. That company grew the product and invested vast sums on money in R&D until, by the 1960s, a lot of vessels were operating with water-lubricated bearings made of rubber. In l9ó0, Duramax Marine's then parent company, Johnson Rubber, decided to compete with BF Goodrich and entered the water-lubricated bearing market by introducing the Johnson demountable rubber stave bearing. Through the years both companies developed and innovated newer rubber polymer bearing technologies. Then in the 1996, Duramax Marine acquired the bearing division of BF Goodrich. All of Goodrich's bearing technology and a senior engineer went to Duramax and it continued making bearings under the name Johnson Cutless. From a lubrication and friction point of view rubber is very different from other water-lubricated bearing materials. 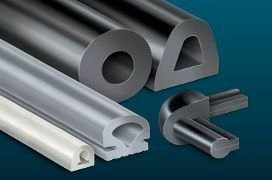 There are complicated theories about contact mechanics and other related subjects but at its most basic, nitrile rubber has the advantage that it can elastically deform and, while it is dry has a high coefficient of friction. When wet, it is extremely slippery with a dynamic coefficient of friction that can be as low as 0.0001. When the propeller shaft starts to rotate, the water already present immediately forces the fluid film underneath the load of the shaft and creates a water-trapping hydrodynamic pocket, creating pressures in the pocket significantly higher than in the other areas around the bearing. Although this film or wedge (similar in principle to an oil wedge acting on the main bearings of an engine) is ultra thin, it is enough to stop any direct contact between shaft and rubber. 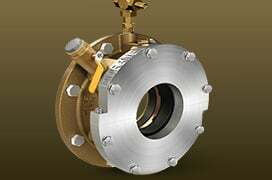 The pressure in the pocket has an added benefit of creating a grit rejecting action and forcing abrasives out of the bearing through the water grooves. “Due to the low viscosity of water as a lubricant, you need the elastic resiliency and durability of rubber to create this pocket and no other material can offer that”, said Mr. Schonauer "The composites do become hydrodynamic, but they don't have the same resiliency as rubber, so when you get into an abrasive environment, rubber outperforms those other materials," he explained. Rubber has an almost perfect Poisson’s ratio (the ratio between transverse and axial strain when a material is compressed or stretched) of about 0.5, which means that rubber is incompressible. This property has been exploited by Duramax by designing bearings that it says have their load-carrying and pocket-forming capabilities optimized. In terms of alignment, rubber bearings are the most forgiving stern tube bearings available, Mr. Schonauer assured Marine Propulsion, reporting that they can tolerate a higher degree of misalignment than any other bearing materials. Rubber never becomes edge loaded because it elastically conforms to accommodate irregular loads. Rubber bearings are particularly effective, he said, because they allow a shaft to turn on its centre of gyration even if this does not correspond exactly with the geometric center. This reduces dynamic stresses and vibration in the supporting structure, outboard struts and stern tube. 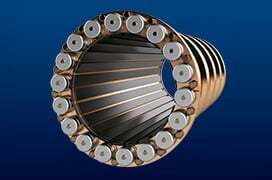 Another unique property of rubber bearings is the ability to absorb and reduce shipboard vibrations and resonance originating from the propulsion shaft. While this is particularly important to designers of military vessels such as submarines, he said, it is also becoming a very important subject for environmentalists who want to see a reduction in noises resonating from ships for ecological reasons. Duramax 'Romor' rubber bearings are used extensively by navies throughout the world. One reason why naval vessels favor water-lubricated bearings is because of their extreme robustness and reliability, he suggested. "Naval Engineers don't have to worry about catastrophic seal failures during complex military maneuvers. In white-metal bearings, if an oil seal fails it will be a very short time before there is a complete loss of propulsion," Mr. Schonauer added. "Most naval and commercial vessels use rubber bearings in their aft struts with a 4:1 length of shaft to diameter ratio but the need to do so is a common misconception," said Mr. Schonauer. "In reality, the length-to-diameter ratio is irrelevant when it comes to rubber bearing design." Instead, the company designs its bearings around shaft load and maximum permissible shaft deflection with a maximum typical design load of 40 psi, which is typically the load limit set by most major class societies for rubber bearings, he said. That general rule was developed by class societies back in the I940s and was based on the limits of natural rubber, he recalled. "In reality they haven't been reviewed or updated to keep pace with the load-handling capacity of today's highly engineered synthetic rubber polymers," he said and mentioned that Duramax Marine has rubber-based bearings that are capable of handling loads greater than 80psi with the properly engineered polymer and geometric bearing design. To address higher load requirements of some applications, Duramax uses a compound called DMX which is a hybrid of rubber, ultra high molecular weight polyethylene and a few other secret ingredients. "It still has the unique water-lubricated pocket forming characteristics of rubber but it controls shaft deflection and is class approved for use in applications with a 2:1 or less length-to- diameter ratio," Mr. Schonauer said. DMX can handle shaft loads in excess of 80-100 psi and it has been approved by Lloyd's Register and has been fully tested by the UK s Ministry of Defense, he said. Under certain conditions, composites may perform as well as rubber bearings but they don’t have the material properties that make rubber far more resilient, Duramax believes. Composites and polyurethanes tend to fail more from hysteretic failure, caused by vibration and cyclic stresses. Mr. Schonauer agreed that "there will always be debate over which is best" and there are applications such as rudder bushings where composites and polyurethane bearings can perform well, “but for all-round performance in stern tube applications, particularly in highly abrasive conditions, rubber will outperform the others." There are two basic concepts for the rubber bearings. First, there are the fully molded types that have rubber molded and vulcanized into a bronze sleeve. As the rubber inside diameter is very difficult to machine in the field, these are typically ordered from the factory to the correct operating size. As a cost-saving measure, the Johnson Cutless bearings can be sent back to the factory where the old rubber will be removed and relined to its original specifications, Mr. Schonauer said. Second, there is the stave type, in which individual 'staves' of rubber, mounted in a very similar way to how the old lignum vitae strips were fitted to stern tube many years ago. In this design the staves are manufactured to fit in a dovetail housing and are locked into a split housing that is machined to accept each individual stave. This allows easier removal of the staves without having to remove the shaft and, once fitted, the external locking ring will keep the staves in the housing during operation. As there is a lot of machining of brass housìngs to be done on this system, it is more expensive. For vessels that want the serviceability of the stave design without the cost of the dovetailed housing, staves can be manufactured with a rounded outer diameter. They are produced to fit exactly into the stern tube with the right compression so that the internal diameter ID is correct for the shaft. A compression collar holds them in place and compresses them longitudinally which locks the staves into the housing and adjusts them to the proper internal diameter. 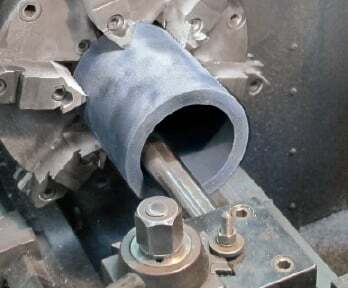 When the shaft liner starts to wear clearances can be maintained by simply exchanging the rubber staves for a thicker stave to accommodate liner wear. The shaft does not need to be pulled and the original clearances are restored, Mr. Schonauer said. Once bearings need refurbishment they can be returned to Duramax for a full overhaul and rubber replacement. "People say the rubber is too soft, but I have never seen any abrasives embedded in the rubber, so that's just not the case," he said. Given the penalties that can arise from oil pollution, including fines and possibly imprisonment in some places, knowing that the risk of oil leaking from the stern tube has been eliminated would bring peace of mind to the master and chief engineer.